You may be wondering what on earth this is? Well it’s a pattern from a range of wall murals at JWWalls and I love this. Marbles is one of their newer designs in the Abstract section. If you’ve not come across wall murals like this before take a look at a post and review I did last year where we tried out the JWWalls service and products. Basically you would choose your design from the JWWalls website or uplaod your own, and then add in the dimensions of te wall on which you are going to place your mural. You can then reposition your area across the mural design to choose the exact section to be printed for you. Our design arrived in 5 pieces pretty much like individual wallpaper pieces, although the paper is much stroger, and then you would follow the instructions to install it. It’s pretty straight forward and looks amazing. I’m loving this Marbles design. I’m pretty drawn to abstract designs anyway, but I love the impact and the colours of this one. 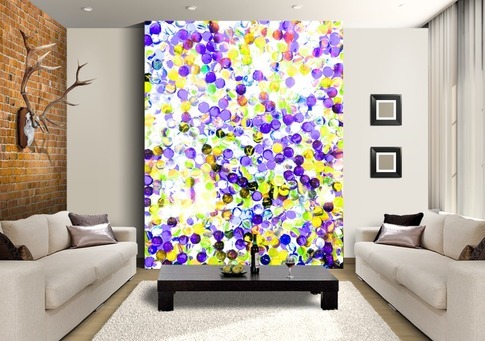 It would look stunning as a feature wall or statement piece. A real talking point. I can’t tell you how many people have commented on our JWWall – even the Tesco delivery man! I really like that painting but to my taste I don’t think it fits in that room…especially it doesn’t match with the brick wall on the left.. What do you think about it? These are some fantastic wall murals!